What could be more useful than a T-shirt dress for wearing on lazy summer days? Perfect for slinging on over a swimming cozzie on the beach, or wearing over leggings on cooler days once autumn arrives. 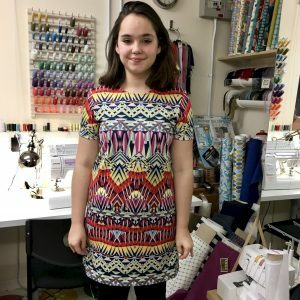 A great introduction to making your own clothes, the relaxed fit of a T-shirt dress is also comfortable for all body shapes. Why not embellish your design with contrast trim or pompoms?